Leveling your first pet team from 1-25 can be a grind, but dont worry. I've got your back! I have around 305 pets leveled to 25 atm, so I know a thing or two about it. 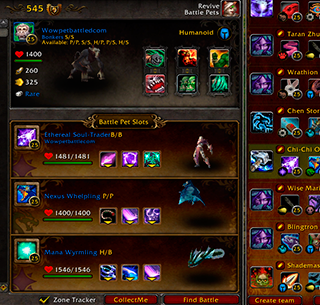 This guide is intended to make your leveling from 1-25 as painless as possible. Its a comprehensive walk-thru including where to start, who to talk to, thier locations, and pet suggestions to defeat them. If your just starting out, please see the Add-ons section of the site to make it even faster! Once you hit 25, switch to the next Guide, "Speed Leveling 1-25" which assumes you already have 2 Gilnaen Ravens, or DMF Crows, and shows you the absolute fastest way to grind out level 25's, not using any trainers or shortcuts. Varzok located at 52,59 in Orgrimar will begin your journey to being a Celestial Tournament Master. He will give you a series of quests that will require you to level a pet to 3, and open your second slot on your pet team. I recomend pets with beast and mechanical abilities. These pets will be strong against the pets your going to face. Zunta is waiting for you with Mumtar and Spike. 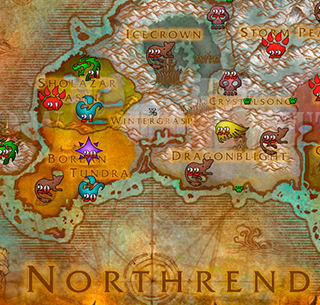 He is located at 43, 28 Tor'kren farm, Directly SE of Thunder Ridge. If you need to heal your pets, There is a stable master located in Razor Hill, Shoja'my 51,41. Dagra the Fierce, Thorn Hill 58,53 a waits you with Springtail, Longneck, and Ripper. Her pets are fairly strong, so you might want to get another pet to level. Dagra uses 3 pets, as do all the trainers from here on out. Dont worry about your third slot, you will unlock it once you have leveled a pet to 5. As you make your way to Analynn, Located in Ashenvale 20,29. Her Pets are Flutterby, Mister Pinch, and Oozer. Be sure you engage the surrounding pets, you want at least 2 of them level 7. I recommed leveling those 2 first, then bring the third in to tie into the XP. 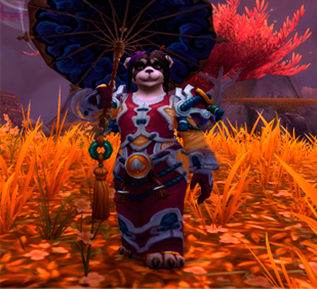 If you need to heal your pets, head over to Hellscream's Reach, Silverwind Refuge or Splintertree Post. Southwest of Krom'gar Fortress Zonya the Sadist is ready for you. Her pets are Acidous, Constrictor, and Odoron. I recommend having at least 1 pet at 9, the rest around 8. You can find stable masters at Krom'gar Fortress and Sun Rock Retreat. Once Zonya is down, get moving to desolace. Merda Stronghoof is standing by with Ambershell, Bounder, and Rockhide. You should have two lvl 9 pets by now, although lvl 10 is best. Most of these trainers have plenty of pets surrounding them to battle and raise your pets levels. There is a stabl emaster near Merda, and also in shadowprey village. Once youve defeated her, its time to move towards the Southern Barrens. Cassandra Kaboom is located at 40,80 her pets are Gismo, Cluckatron, and Whirls. There mechanical so you want to have some elemetals around levels 10-12. 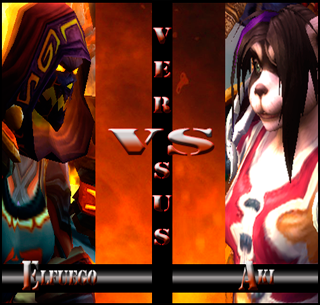 Once she is defeated you will be able to engage the next set of tamers on Kalimdor. Traitor Gluk is your first opponent. You can find him at 60,50 near Dire Maul. His pets are Glimmer, Prancer, and Rasp. You should have lvl 12-13 pets here. 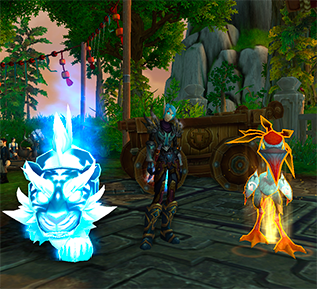 If you need to heal your pets you can find stable masters within Feathermoon Stronghold, Camp Mojache, and Camp Ataya. If your pets are around lvl 13 or so, its time to go to Thousand Needles. Grim Totem is up next. Cho'guana, Indigon, and Plauge are fairly simple to beat. She is located at 32,33. Shes NW of Darkcloud Pinnacle and shouldnt give you too much trouble. Humanoid are stong defenders against Critter. You want one or two lvl 14 pets to make the fight easiest. Grazzle the Great is here in Dustwalow, and youll find Blaze, Firetooth, and Flameclaw to be no match for you. Humanoid attacks are strong against Dragonkin. Be sure to have at least two lvl 15 pets before leaving this area, as they will play apart in Felwood where were going next. Zoltan is pretty easy. His pets are Beamer, Hatewalker, and Ultramus. The magic pets should go down easily. Lvl 16 pets are ideal here, but 15's should work as well. Your stable master is located insde Whisperwind Grove. 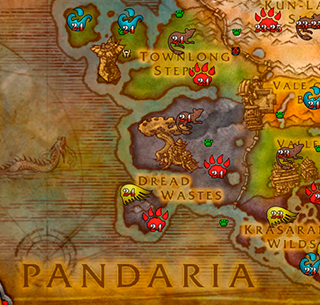 You going to want at least two lvl 16 pets before venturing to Moonglade, so grind the local wildlife! 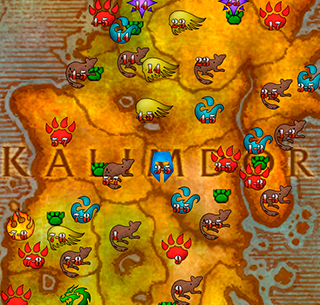 Elena Flutterfly is located at 46,61. She has Lacewing, Beacon, and Willow for pets. Start by grinding the area untill you have two level 17's. After you defeat her, You should have earned the Taming Kalmidor Achievement. In doing so, you will be able to fight each of the tamers in daily quests to earn Reward Bags. After you have those two lvl 17 pets, we can safely move into Winterspring. Stone Cold Trixxy is going to be the hardest trainer you will come across up to now. She has Blizzy, Frostmaw, and Tinygos on her team. The diversity in her pets and thier spells can be very daunting, so be sure you have two level 19's and one 20 on your team, and you should defeat her easily. Once shes down, you will complete the Kalimdor achievement. Now you can battle these tamers in dailies also. I would recomend returning to grind them to gain a little Xp boost and start in on your Reward Bags.